The Rylands Haggadah, created in Catalonia Spain sometime around 1330, is a towering masterpiece of Jewish Art. In addition to pages of piyutim surrounded by ornate decorative and figurative micrography, richly decorated Haggadah text and blessings, there is a 13 page miniature cycle depicting the Exodus story from Moses at the Burning Bush to the Crossing of the Red Sea. This breathtaking work of art has not gone unnoticed. 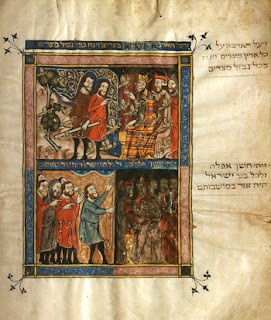 A full-scale facsimile of the Haggadah with a scholarly introduction and translation was published by Harry N. Abrams, Inc. in 1988, aspects of which were reviewed on this page in March 2001. More recently the Rylands Haggadah was extensively compared to its “Brother” British Library Haggadah in Marc Michael Epstein’s “The Medieval Haggadah (2011)” as well as Katrin Kogman-Appel’s briefer investigation in “Illuminated Haggadot from Medieval Spain (2006).” But most significantly for us, this diminutive gem is currently in New York's Metropolitan Museum of Art until September 30. It is not to be missed.